In our links, the original link to the WJW-TV History pages seems to be broken..I have replaced it with the Internet Archive version..It seems to load slower (at least on my computer) but the pages seem to work ok. Let me know if there are any problems with the link. From Frank Macek at WKYC-TV 3 and his Director's Cut Blog. Virgil Dominic at the TV 3 News Set in the early 1970's..
November 1967 TV Guide Ad for the WKYC-TV Newsteam at the time Including Chet Huntley and David Brinkley of NBC News, with Virgil Dominic, Wally Kinnan and Jim Graner. 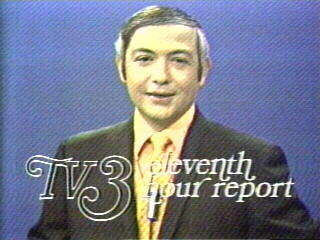 Screengrab of a Virgil Dominic photo from a WKYC Anniversary Show. I would like to direct your attention today to Frank Macek's Director's Cut Blog...He has an outstanding "Where are they Now" post on Virgil Dominic, who was one of the finest Newsmen ever in Cleveland TV and by all accounts, a consummate gentleman, always kind to co-workers and employees and just a real class act. 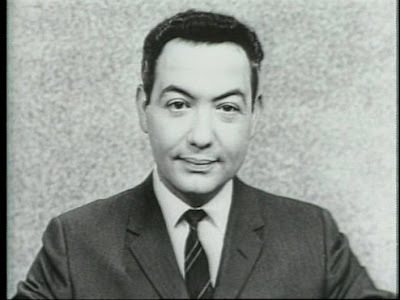 He was in Cleveland from 1965-72 as main news anchor at WKYC. He was then News Director and Anchor in Atlanta at WXIA-TV from 1972-77 where he led a young news team to the top of the ratings in Atlanta before returning to Cleveland in 1977 for a long stint as News Director, then General Manager at WJW-TV until just after the station was sold to FOX..He recently has returned to WKYC-TV as a consultant..
An excellent read:The WKYC-TV News Team up to the early 1970's was always one of my favorites..
As most of the blog's regular readers may notice, I tend to shy away from advertising, or "plugs" as it were except when it relates directly to the blog itself. I've never done ads from Google, etc. I get enjoyment from doing the blog without needing to make money from it. I am also involved in a number of other message boards/websites, many of which are linked on the left. The biggest involvement In a messageboard I have is as a moderator on the bigchuckandliljohn website..They are dedicated to preserving the Legacy of The Horror-Host tradition at WJW-TV 8..Especially Hoolihan and Big Chuck/Lil John, and of Course, Ghoulardi. Ron Garsteck' s "Turn Blue Productions" has been involved in putting on "Ghoulardifest" from the first one in 1997.After Ernie Anderson's passing..Other Festivals were held in 1998 and 2007..With the Big Chuck and Lil John Sci-Fi Fest in 1999. 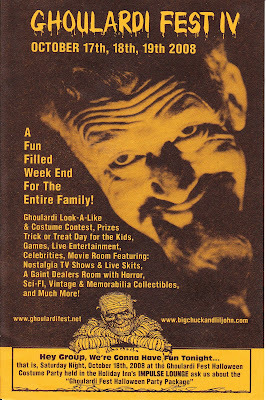 This year's Ghoulardifest will be held October 17-19 at Holiday Inn-Independence, Ohio. 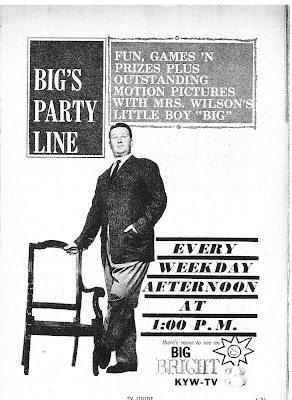 Mike Olszewski-Morning host at WNCX-He will premiere a "Lost Film" of a Cleveland TV Special not seen since 1962. Jim Syzmanski-Festival MC. He acted in a number of Big Chuck and Lil John Skits. Tom Feran-Author of new Chuck Schodowski book, which is planned to be debuted at the Festival.. These along with many other guests will be at the Ghoulardifest..There will be large Dealer Tables throughout, as well as film showings..This is shaping up to be the best Ghoulardifest yet..
My wife and I will be there from Friday Night till Saturday afternoon. Will try to share a few pictures and a report here on the blog..
From Hoolihan and Big Chuck..Dueling Accordians..A takeoff on the theme from "Deliverance"..From the early 1970's.. 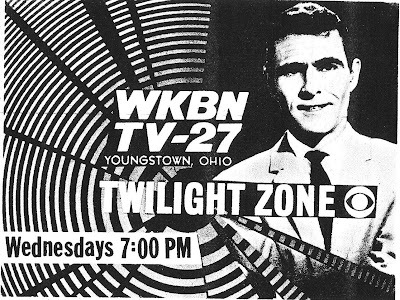 Ad for WKBF-61's 10PM News, anchored by the late John Herrington from 1968-70, who would make his name at WKYC-TV 3 as a field reporter from 1971-93. 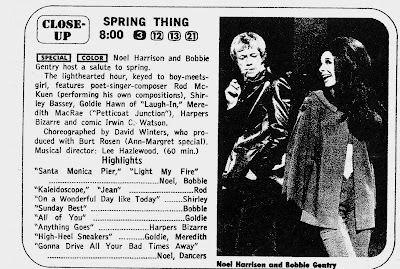 A TV Guide Ad, then a "Close-Up" for "Spring Thing" a "Really Together" NBC Music Special starring Noel Harrison, Formerly of "The Girl From UNCLE" and current pop star Bobbie Gentry..with guests including Rod McKuen, Goldie Hawn from Laugh-In and Petticoat Junction's Meredith MacRae. This strikes me kind of corny these days..while TV in the late 60's was trying to be oh so relevant, cool and "with it"
May 1969...A time of progress..yet a time of polarization..Man would be on the moon within 2 months, yet America was in a state of unrest, as the Vietnam War raged with no end in sight..There were riots on college campuses in California that would spread throughout the Country, culminating in the May 1970 Kent State shootings..The Smothers Brothers Show, on their last legs with CBS Network Brass because of controversial content, would be canceled June 8..
As Network Primetime was just about all Color by 1966-67, well over half of all TV Shows produced locally were in color, with the notable exception of WVIZ-25 NET/PBS..Though some shows on TV 25 were in color..
Three Independents: Channel 17 in Canton, and Channels 43 and 61 in Cleveland were operating by this time..Franz was airing Daily and Sunday on TV 8..
10PM NET Special-Senate hearing on Funding for the Corporation For Public Broadcasting, which reselted in the Founding of PBS in 1970. Comment:Apparently all of 33's local shows were still in Black and White on this late date. Jim Doney with a "Special Version" of "Adventure Road." with "The World's Foremost expert on the Continent of Africa"..This shows what may well have been the opening of Adventure Road in 1969..Though I know this opening was at least used as late as 1971. The "related videos" should have the parts I don't post here, as well as some promo spots for the show..Cleveland Radio Legend Bob James produced the show. Highlights:A "retro-look" WEWS station ID..An opening disclaimer "No white socks or Kielbasa here"..
A funny spoof of local Cleveland TV News in 1980 with "Smiling Mona Mona" and "Overpaid Doug Hambrick" "EyewitnessActionCenterNews"
Paul Tapie, in a YouTube Comment, says that they almost sold this show to Paramount in Syndication. 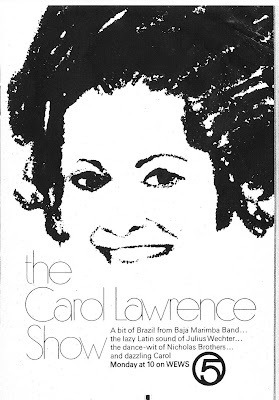 Interesting artifact of the early 1980's..Anybody with more info about the date this show aired, or if it was a series..email or comment..Thanks.. In writing the blog here, one of the things I wanted to do is provides links to other sites. These are generally in two categories:Sites that I enjoy personally for the content, and TV/Radio News sites:I have links pertaining to Ohio, West Virginia, Michigan, Pittsburgh, and New York/New England..Some of the best News/Blog sites in the business. Today I'd like to add a new one:The Press and Tower from Erie, Pa. The Late Jack Tirak had written a popular, Erie-based Blog known as the "Erie Media Go-Round." His recent passing left a void, as Tirak's family didnt wish to have anyone else carry on with Jack's Blog.. Enter Joel Natale, a Veteran Erie Broadcaster, GM for 14 years at Erie area Christian Broadcaster WCTL-106.1, and earlier at WJET, WDOE. WSEG, and WXKC in the Erie area. 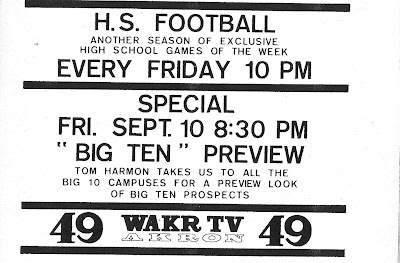 He bagan "The Press and Tower"..To carry on the tradtion that Jack Tirak started, though not to copy him..Cleveland Classic Media wishes the best to Joel Natale as he begins this new venture..
WAKR-TV Ad for tape delayed High School Football Games. It doesnt say here or in the listing, but I would assume Sports Director Bob Wylie was part of the telecast team. 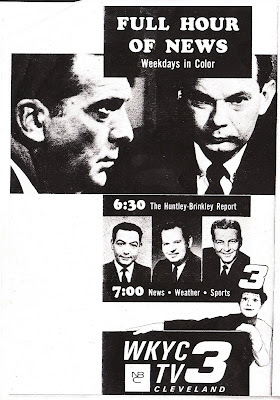 Taking a brief look at September 1965..Carl Stern and Bud Dancy were still the news team at Channel 3, with Wally Kinnan Weather and Jim Graner Sports..Labor Day, September 6, found WYTV-33 and WAKR-49 Carrying a Giants-Dodgers Baseball Game. The Indians had a home doubleheader with Washington so The Game was blacked out on Channel 5. 77 Sunset Strip reruns "Return" to TV 5 at 4PM weekdays on Sept. 6. followed by Captain Penny's Comedy Clubhouse for an hour and a half from 5-6:30. 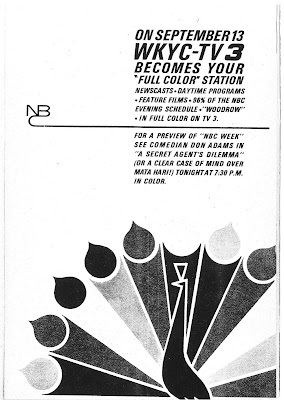 TV 3 aired no local color to this point, though Many NBC shows were in color, and Channel 3 would introduce Local color September 13, 1965 according to the ad above.. 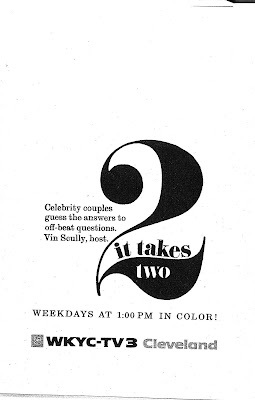 It was around this time (mid 1960's) that the networks really began pushing the fall season. This may have been the first time NBC really began to use "NBC Week" as a yearly tag for introducing their fall premiere..September 12-19, 1965 was "NBC Week"..With 15 new shows. Most not lasting more than one season..
33-49 Baseball-SF Giants/LA Dodgers-Chris Schenkel, Leo Durocher, Jackie Robinson report. 8 CBS News Special-SPECIAL COLOR-"Vietnam:A Day At War"